Earth getting a Second Sun? In a specific instance of the Supernova claim that 2012 proponents often make, Betelgeuse is linked to the 2012 doomsday. This article shows why this claim is incorrect. 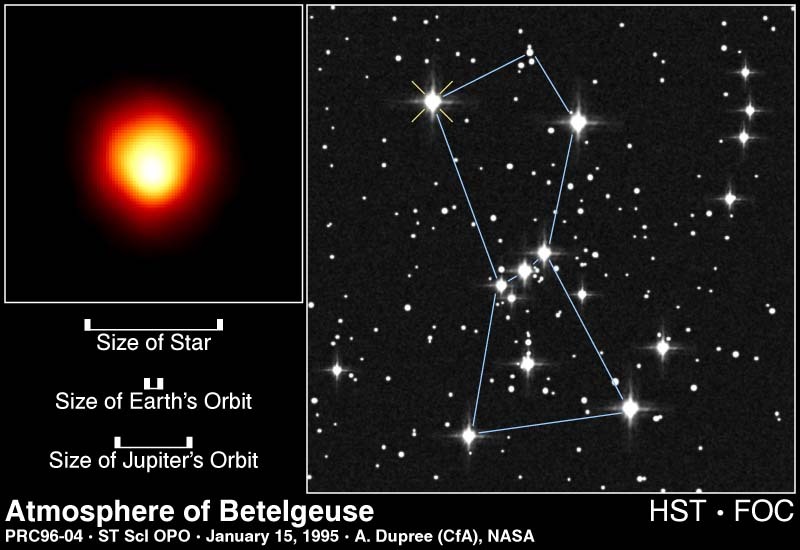 Betelgeuse (Alpha Orionis, α Orionis, α Ori) is a red supergiant star in the constellation of Orion. It marks the left shoulder of the figure of Orion the hunter. Before all of you 2012 doomsday believers go all haywire, then you should know that this event will be harmless to Earth. Apparently the short piece on Chacha was fueled by either the original story on news.com.au or by the followup piece on the Huffington Post . In the original article, the date "2012" is mentioned three times, including in one of the bullet points at the top of the article, although Dr. Carter makes no such claim in his quoted remarks. When Dr. Carter clearly did not say that in the original article3. Plait also points out that the Huffington Post article clearly misquotes the original. But what's all this fuss about the star exploding by 2012? That's complete garbage. There is absolutely no indication that the star will explode in the next year or so. Even the most advanced telescopes and sophisticated computer models cannot predict an exploding star with that precision! By the article's own admission, the supernova might not happen for a million years — begging the question as to why a half-baked 2012 Betelgeuse doomsday theory is even being mentioned. Although Carter does provide quotes, he does not say that due to a Betelgeuse supernova "we'd see a second sun", "there may also be no night" or "the Star Wars-esque scenario could happen by 2012." These statements were made by the reporter, not the interviewee (as far as we can tell from the article). Dr Carter followed up his comments today, saying he knew of no scientific basis to suggest the star would go supernova in time to satisfy doomsday followers' predictions. He instead pointed to a New Scientist article that quoted Nobel prize winner Charles Townes as saying there was no way of knowing how red giants behave at the end of their life cycle. Reading between the lines, we wonder how Dr. Carter felt about being linked to the 2012 doomsday, when his original comments had nothing to do with it? We have shown that the prevailing scientific opinion is that Betelgeuse poses no threat to us, now, in 2012, or within the next million years.